Every story has a beginning and an end which is where this film begins. Louise is a language expert tasked with communicating with an alien race that has arrived on Earth for unknown reasons. With the help of Ian, a Physicist, can they decipher an alien language in time before war breaks out? This film is a slow burner, there is no two ways about it. It doesn’t drag as such no, but time passes slowly. In an age where superhero films are dominant and action hits you in the face like bang all the time, a film that takes its time to tell you a story is almost novel and oddly enjoyable. The timeline is dogged by Louise’s memories. It is almost as if the events that are taking place are triggering them and can take place at the oddest of times. Amy Adams is our lead and her acting is stellar. She brings a vulnerability to her character who is also aware of the gravity of the situation that is placed on her shoulders. She was, at first scared and unsure of how to go forward with the aliens, but as time goes by she grows confident. Bold even. Jeremy Renner as a dry-humoured Physicist adds a composed air to the duo, a strength that you don’t realise is needed. Forest Whitaker is the General in charge of the USA operation and goes against the stereotype that he would be trigger happy. He is a quiet, peaceful man who wants the best outcome possible and is willing to go with ideas that he doesn’t quite understand. Coupled with the score, often quiet and almost indecipherable makes you feel the characters and identify with the acting, and not the music. Even the scenes in the film makes you connect with the characters, especially Louise as you see her story unfold in front of you. The plot, unlike Lucy – another sci-fi film, is comprehensible. You understand what is happening and enjoy the mystery that is provided for you. It was a great way to stir conversation after the film about how quickly you or your friends were able to grasp certain plot elements. It doesn’t cause a headache as you try to figure it out, it all becomes clear as the film goes on. Time is the biggest enemy, and comrade to the characters. The editing is simply superb adding to the enjoyment. This film truly makes you think about the divides in the Human Race; how differently every country would tackles a problem and how dependant on current world politics, just how they would react. This film really could be an Oscar contender – yes we are nearing that time of year again. Go see this film and you will understand why. For me, it rates 4.5/5. Why the 0.5 deduction? There are two super cheesy lines that distracted me from what until they were said, was a superbly written film. Why. Just Why. 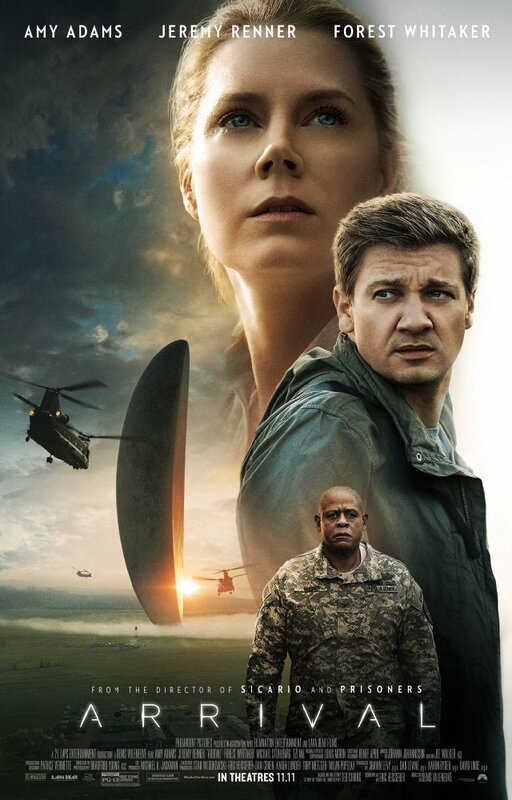 2016AlienAliensAmy AdamsArrivalDenis VilleneuveDramaFilm ReviewForest WhitakerJeremy RennerMovie ReviewsMysteryOscarsScience FictionStory of your LifeWhy are they here?